In 1940, the Cornell Cooperative Society (the group that founded what became the Cornell Store) published an illustrated look at Cornell University, past and present, wholly written and illustrated by then-undergraduate student Steve Barker '41. Barker died in 2006; his son, Rev. Fred Barker of Derby Center, Vt., says that as an undergraduate, his father illustrated numerous covers of books sold by the Cooperative Society and that the "We Cornellians" book was created "partly for putting himself through Cornell." But Barker was also fascinated with the history and culture of the university. "He loved it," Fred Barker says. Barker says that his two sons, Steve Barker's grandchildren, "both enjoy illustrating as my Dad did." 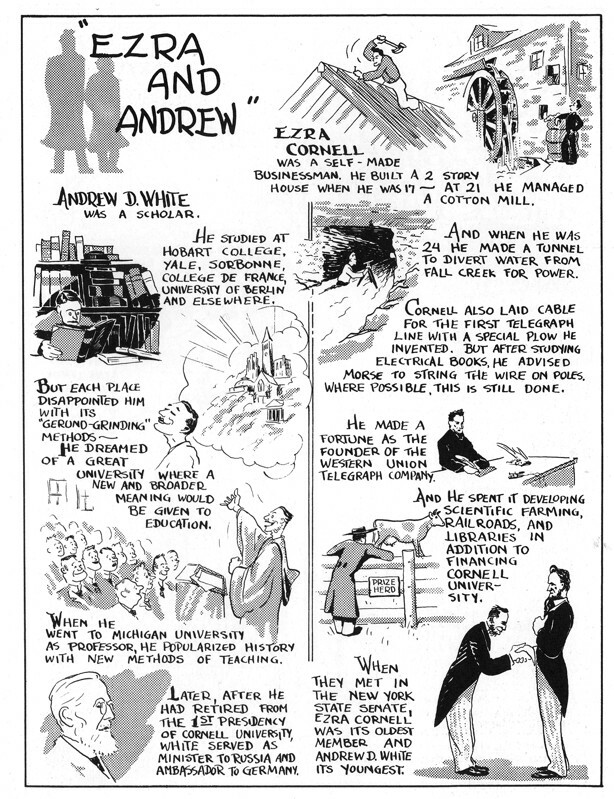 "Ezra and Andrew" panel from illustrated book "We Cornellians"